Alicia Silverstone at the Hollywood Life Magazine's Breakthrough of the Year Awards. Alicia Silverstone at the re-launch of Triggerstreet.com. Alicia Silverstone at the premiere of "Babel." Alicia Silverstone at the GQ Men of The Year Awards. Alicia Silverstone and Cuba Gooding Jr at the "Movies Rock" A Celebration of Music In Film. Alicia Silverstone at the "Movies Rock" A Celebration of Music In Film. Alicia Silverstone at the LA Galaxy vs. Chelsea FC soccer game. Alicia Silverstone and Christopher Jarecki at the "Movies Rock" A Celebration of Music In Film after party. Alicia Silverstone at the 15th Annual Environmental Media Awards. Alicia Silverstone and husband Chris Jarecki at the "A Stellar Night" Gala Honoring Dakota Fanning by the Starlight Starbright Children's Foundation. Alicia Silverstone at the Compassion Gala sponsored by the Physicians Committee for Responsible Medicine (PCRM). Alicia Silverstone at the premiere of "North Country." Alicia Silverstone at the "A Stellar Night" Gala Honoring Dakota Fanning by the Starlight Starbright Children's Foundation. Alicia Silverstone and Sophie Okonedo at the UK premiere of "Stormbreaker." Alicia Silverstone at the after party following the UK premiere of "Stormbreaker." Alicia Silverstone at the creative coalition VIP "Salome" party. Alicia Silverstone at the Hollywood Reporter's 35th annual Key Art Awards. 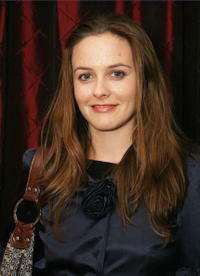 Alicia Silverstone at the New York premiere of "Butter."